This schedule is in reference to the deployment announced and planned by Ministry of Telecommunications (MOT). We are in close coordination with Ministry of Telecommunications (MOT), and we will be ready to start offering Fiber Services immediately in any area where the deployment is completed. The plan might be subject to change according to the MOT projections. The data presented above is subject to change. Kindly refer back to this page for continuous updates. IDM Fiber is the latest and fastest Internet access solution that IDM is introducing to the market. The service is now available in Achrafieh, Hamra and Ras Beirut. Please click here for a detailed coverage view. IDM fiber delivers to both corporate and residential customers a reliable Internet connection with unprecedented speeds reaching 300Mbps. The new solution, also known as Fiber to The Home or FTTH will answer all your current and future high bandwidth needs, both for downloads or uploads, allowing you to connect all of your devices at home simultaneously while enjoying high definition streaming quality and uploading your photos and videos in seconds or minutes. Simply put, IDM fiber will allow you to do a lot more in much less time. Ultra High Speed Internet Connection Reaching 300 Mbps for downloads and allowing uploads up to 30Mbps. Minimal Connection Latency Essential for Online Gaming and Video Chat. Higher Reliability Since fiber is much less affected by distance attenuation, cable quality and interference. Stronger Security As it is almost impossible to tap into fiber cables, while corporate customers benefit from a dedicated fiber cable each. Wider and Stable Reach Because whether your home is close to or distant from the Central Office, you will always enjoy the same quality of connection. Self-Care mobile application providing account management tools, consumption monitoring, account renewal and much more. Convenient payment methods including Prepaid Cards, Online Payment or Bank Domiciliation. The set up fees include the installation and the required fiber modem. Please ask for a special group rate. The Unlimited Night service allows the subscriber to benefit from unmetered traffic consumption every day between 12:00 am and 7:00 am. Among other benefits, the Unlimited Night service is the perfect solution to the frequently recurring large downloads that PCs, laptops, tablets, mobile phones or any other connected smart devices perform regularly to update applications and operating systems. The amount of data consumed during the Unlimited Night period will not be deducted from the monthly traffic quota assigned with each plan, hence keeping this traffic available for your everyday use. *Applicable to selected IDM Fiber plans only. 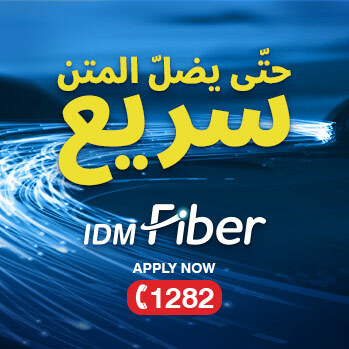 Check IDM Fiber Plans and Prices for more details. For Postpaid subscribers (accounts with a Bank Withdrawal Agreement as a payment method), a user can activate / deactivate this feature from the account management section on IDM’s web site. For a Prepaid subscriber (accounts renewed using a Prepaid Scratch Card or a Credit Card), a user can purchase a “Services” card that he can activate from the account management section of IDM’s website. When activating a service card, a user is asked to choose the feature he wishes to activate. Once activated, the subscriber will benefit from an Unlimited consumption between 12:00 am and 07:00 am every day for the duration of the current Internet subscription. The Unlimited Night feature subscription will always expire at the end of the Fiber subscription’s current billing cycle (whether this was due to the end of the billing cycle or because of the monthly quota traffic consumption), irrespective of the Unlimited Night feature activation date, and will have to be renewed when or after the Fiber subscription has been renewed. 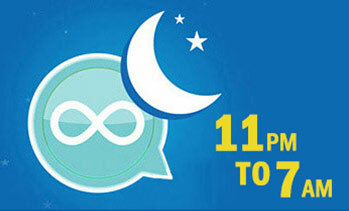 For a Postpaid user, the first time subscription will remain valid till the end of the current month. The subscription to the Unlimited Night feature will be renewed automatically with the coming month’s Fiber subscription until the user decides to stop it. For a Prepaid user, a subscription to the Unlimited Night feature will remain valid until the Fiber subscription expires, where this period could be less than 30 days, depending on the date of the feature activation. Ex. : if a user subscribes to the Unlimited Night Feature on the 7th of a month, and his Fiber subscription expires on the 2nd of the next month, the user will benefit from a 25 days Unlimited Night. Postpaid users will need to sign in to the account management section of IDM’s website and stop the service. When stopped, the feature will be billed for the current month and will remain available till the end of the current month/billing cycle. Login to IDM's Account Management page and visit my Services section. Click on FREE TRIAL and benefit from an Internet access protection till the end of your current subscription billing cycle. IDM's Parental Control enables you to blacklist (block) or whitelist (allow) sites in an allowed category or in a blocked category respectively. IDM's Parental Control protects all devices connected to the Internet through your protected IDM connection by filtering all the content entering your house, irrespective of the device requesting the content, whether it is a Phone, a Tablet, a Gaming Console, a PC or a Smart TV. IDM's Parental Control service offers you 3 preset and one custom levels of protection. You can choose a Light, Moderate or a Strict level of filtering or you can create your own custom level and choose which categories of content you want to block or allow. You can turn "ON/OFF" the protection from IDM's mobile application whether you are at home, at work or abroad. You can as well from IDM website log in to IDM's Account Management section and manage the Protection. Control the protection & manage the subscriptions through IDM's Mobile App. You can instantly turn protection ON or OFF using IDM's easy to use mobile application, no matter where you are connected from. Schedule access to the Internet according to Time or Content.